Parkhall “Integrated” College: The “pain” ahead? 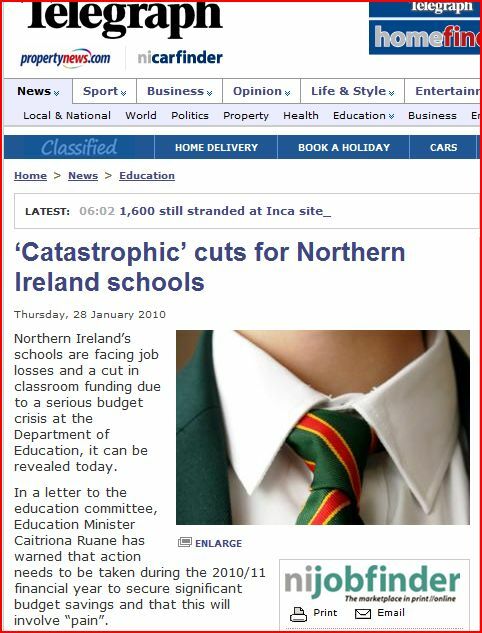 Having rushed ahead to re brand itself as a controlled integrated school despite having failed to attract the requisite percentage of pupils from the minority community, Parkhall College in Antrim may be faced with another harsh reality – no new school building – the promise used to sell “integration” . In the body of the article claims are made that members of the Board of Governors voiced strong reservations about “sectarian headcounts”. The records show that the move to integrated status was unanimously approved by the entire board of governors. In the run up to elections it seems the UUCNF want to ride two horses.